One day, out of the blue, I received an email from well-respected writer Renee Bess. 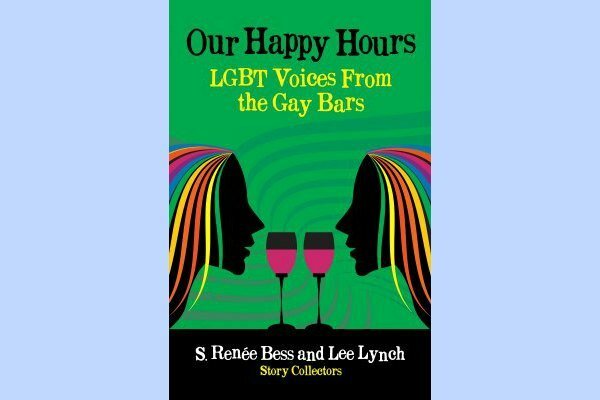 In her thoughtful, elegant style, she asked if I would be interested in working together to produce an anthology about the role gay bars have played in our lives. I was on board before I finished reading. A gay bar anthology, I immediately thought, was a brilliant idea and worked in so many ways. For one thing, it would capture a big chunk of our history, and document it, whether it be in the form of memoirs or poems or fiction or essays. For another, it would honor that history. Perhaps, I hoped, it would give young LGBT people an understanding of the attraction of the bars, of places of our own, back when holding hands under a table was both daring and forbidden. Happy Hours – Our Lives In The Gay Bars is not about the pleasures or tragedies of alcohol, but the camaraderie we found – or didn’t find – inside those loud, dark, smoke-filled rooms where we took our freedoms. Renee emphasized how important it was to her to have a widely diverse collection. I felt the same and we committed to vigorous outreach. Renee proposed we do the book as a fundraiser for youth shelters, the antithesis of the bars. All profits would go to that cause. Sounded perfect to me. We both chose programs in the cities where we entered the gay world, Philadelphia for Renee and New York for me. We had an enormous pool of contributors from which to draw. Not many writers resisted the companionship offered in the heydays of the bars. That’s where we could feel normal for a while, where we could go to hang out with friends, meet our soulmates, dance, celebrate, blot out pain with liquor and sympathetic ears, and be our real selves for a few hours. Not to romanticize the experience, the bars also gave us the opportunity to feel isolated from our own people, breathe in dangerous levels of tobacco smoke, develop into alcoholics, get into fights, be ripped off by the owners, and arrested by the police. I wrote a whole book about that last, it’s called The Raid. When I did Off the Rag: Lesbians Writing on Menopause, and The Butch Cook Book, my co-editors and I had to coax, beg, plead, transcribe, and otherwise badger submissions from women interested in writing about the subject. With Happy Hours, Renee and I were elated to be inundated with heartfelt, quality donations of every type of writing from a hefty cross section of our tribe. And donations they were. We’re really hoping to make a difference to our kids with this fundraiser; every stitch of work is volunteered. Of course, writers are used to giving away our work just to get it into print somewhere. This time, though, the publisher, Patty Schramm is taking no money and expending hours and hours plus a goodly sum for producing the book, which will be the inaugural project for her company, Flashpoint Publications. Patty’s knowledge of the publishing process is magic. She’s doing the typesetting herself. Award winning cover artist Ann McMan is in great demand, yet gave her time not only to produce a genius cover, but to our requests for tweaks and changes. The result is a dynamic and irresistible cover that truly represents what’s inside. Writers Lori Lake and Nann Dunn have also heartily pitched in. Editing, copyrighting – all the unglamorous stuff has been taken over by the gay women who seem to live to create and broaden our literature. My energy reserves get lower every year, but I knew this book needed to be out there and Renee was the perfect partner to make it happen. She’s done all the hard administrative work: concept, complications, keeping on top of things. We’re both pretty low key and agreeable types, so have had no conflicts or arguments. A lot of the time, all I had to do was say yes to Renee’s creative ideas. I continue to be stunned by the devotion everyone has shown to our cause. The ambitious contributors, though, are a special breed. Their excitement over Happy Hours is a joy to see. All they needed was the go-ahead and they began promotion and marketing on their own. Our writers and poets make a little community, with their wide spectrum of gender, color, backgrounds, and ethnicity. All the collaborators remind me of the old days, when we were so embattled, a united front was a necessity. While I don’t long for the days of collectives, communes, and the teachings of Chairman Mao’s Little Red Book, Happy Hours is the product of the kind of enthusiastic shared undertaking that powered the labor, civil rights, women’s, and gay movements. After the Stonewall riots, it may be the best thing to ever come out of our bars.